Looking to liven up your packed lunch routine? 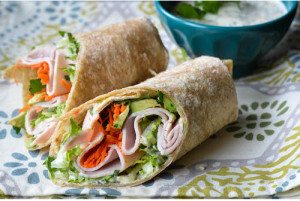 Turkey Wraps are quick and easy to put together, and they’re a nice change from the usual salad or sandwich! Ours are packed with crunchy lettuce and carrots, low-sodium cold cuts, and spread with a creamy and delicious Garlic Sauce. You’ll want to use our Garlic Sauce for more than just these wraps. With lots of fresh herbs and a kick from fresh lemon zest and juice, it’s fantastic on grilled fish, kebabs, or spread onto roast beef sandwiches. For a version that’s lower in fat and cholesterol, feel free to substitute nonfat Greek yogurt for some or all of the mayonnaise. You can also switch up the fresh herbs, using tarragon for a French flair, or oregano and thyme for a Mediterranean flavor. 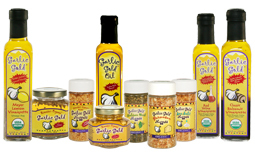 2 tablespoons Garlic Gold® Nuggets in Oil. Spread two tablespoons of Garlic Sauce in a wide stripe across the bottom third of a tortilla. On top of the Garlic Sauce, layer a fourth of the shredded romaine, turkey, carrots, and avocado. Tuck in the sides of the tortilla, then roll as you would a burrito or eggroll. Repeat with remaining wraps. Cut wraps in half diagonally and serve with more sauce on the side for dipping.